Shameem’s song “Under One Sun” has been nominated in the international Independent Music Awards, in the “Sing Out For Social Action” category. With “Back to the Ground” being nominated in the R&B/ Soul Song category in 2013, this is Shameem’s second nomination in the Independent Music Awards. The awards are judged by a stellar array of judges including Sharon Jones, Amanda Palmer, Raul Midón, Jane Monheit and Meshell Ndegeocello to name but a few. There is also a people’s choice section, known as the IMA Vox Pop. You can vote for “Under One Sun” to win it’s category in the people’s choice section here. Shameem is very excited to announce that she will be performing at Canadian Music Week 2015, held in Toronto in May. Now in its 33rd year, Canadian Music Week is recognized as one of the premier entertainment events in North America, combining conferences, a cutting edge trade exhibition, award shows, film festival, comedy festival and Canada’s biggest New Music Festival. Performance details and tickets are available here. Notes: Shameem performs at Canadian Music Week. 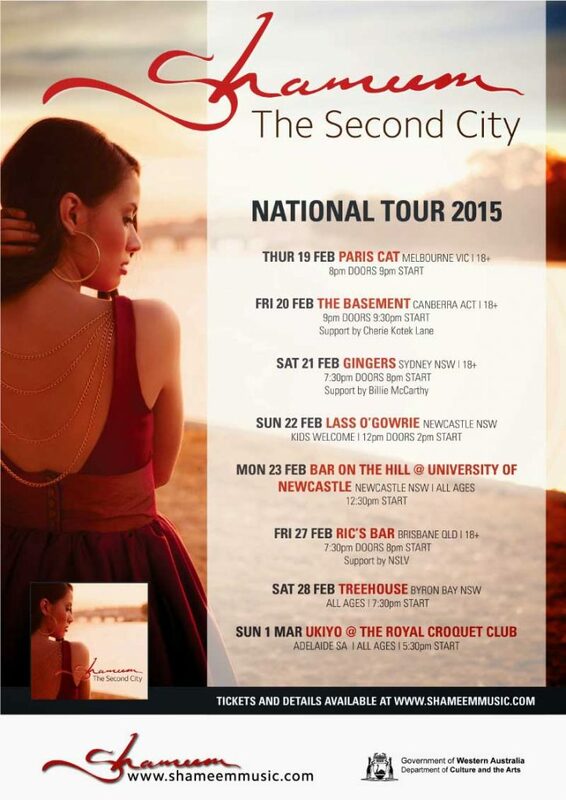 To celebrate the release of her new album “The Second City”, Shameem’s full band is undertaking a national Australian tour in late February/ early March, spanning 9 shows in 7 cities over 11 days! All the details for the shows, including ticket links, are here, barring one surprise solo show which will be announced on Facebook and Twitter during the tour itself. Shameem has now released her eagerly anticipated sophomore album, The Second City. The Second City was co-produced by Shameem together with Rob Agostini (Rai Thistlethwaite, Tim & Jean) at Soundbaker Studios in Perth, the world’s most isolated capital city and Shameem’s hometown. Rich with soulful vocals and keys-driven works of art, the record offers insight in to Shameem’s inspiring passion for life, positivity, spirituality and general desire to assist in the betterment of the world via song and goodwill. It touches on a number of thought-provoking themes over the generously loaded 15 tracks: the overcoming of prejudice, broken trust and forgiveness, thankfulness, and gratitude in the face of difficulties. The album includes the singles “Beautiful Soul“, which was awarded 4th place in the Australian Songwriting Contest Contemporary Pop/ Dance category, and “Under One Sun“, which was co-written with Grammy-winning producer James Bryan (Nelly Furtado, Olly Murs, James Morrison). While remaining true to Shameem’s roots in neo-soul, this album also shows the mixed-race artist paying homage to her Iranian heritage as well as exploring styles as diverse as reggae and rock. The Second City is available for purchase on iTunes and Bandcamp. To find out more behind the story of The Second City, you can check out a trailer for the album, or read Shameem’s explanations of the inspiration behind the lyrics. “The Second City” Album Launch show in Perth is just around the corner, celebrating the release of Shameem’s sophomore album in her hometown before she takes off for a national tour. Shameem will be putting on a unique full band show at premier Perth venue Subiaco Arts Centre, with special guests and never-before-heard arrangements of her music. There will also be a display of original artwork that was created by several WA artists for her photo and video shoots associated with this album. Tickets are available here from Ticketek. Shameem will be supported by Trevor Jalla. 15 years as a full-time musician has taken Trevor from European festival stages and club dates across the USA to the most intimate solo acoustic performances around Perth and South-West WA. His unique blend of soul, folk, country and blues pays homage to influences such as Ray Charles, James Taylor, George Jones and Robert Johnson. Shameem’s special guests will include rapper Empty and hip-hop dancers Lisa and Chido from The Dance Workshop. Shameem is stoked to announce the release of her brand new single “Under One Sun”! “Under One Sun” is now available for purchase on iTunes. The track was co-written with and produced by Grammy-winning UK-based producer James Bryan, who has worked with such artists as Nelly Furtado, Olly Murs and James Morrison. Ever true to Shameem’s mission to encourage social and spiritual consciousness, the lyrics of the song carry an important message of unity. The track has a bright, soul-pop feel, with a hint at the soulful grooves of Stevie Wonder and the rich harmonies of D’Angelo. The captivating video, in which EVERYTHING is made of paper, was produced by up and coming Perth director Jason Eshraghian. It was created in collaboration with Western Australian artists Renee Farrant, who created all the paper objects in the video including Shameem’s outfit, and Phil Doncon, who created the painting that is featured in the video’s narrative. Shameem is honoured to have been recognised in the Australian Songwriting Contest, with “Beautiful Soul” taking fourth place in the Contemporary Pop/ Dance category and “I Give Thanks” being nominated in the Top 30 of the Spiritual category. Shameem will be launching her sophomore album “The Second City” with a special and unique show at the Subiaco Arts Centre. Tickets are now available here from Ticketek. 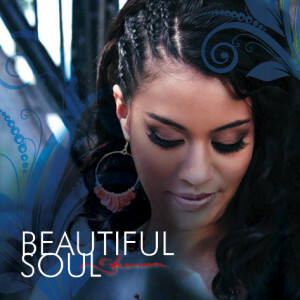 Shameem is very excited to announce the release of her brand new single “Beautiful Soul”! “Beautiful Soul” is available for purchase on iTunes and BandCamp, and streaming services such as Spotify. Check out the sunshine-drenched music video, produced by Red Bird Creative in Shameem’s hometown of Perth. “Beautiful Soul” is the first single from The Second City, Shameem’s forthcoming sophomore album. Driven by Shameem’s expressive, soulful vocals, an unforgettable hook and a phat urban beat, “Beautiful Soul” draws together elements of R&B, soul and a slight tinge of jazz. Shameem’s sense of social consciousness has informed the lyrics, which draw attention to the way in which children are taught prejudice and indifference by adults. Shameem, who considers herself a “musician” rather than a “singer”, not only wrote but also co-produced the track, contributing to the drum programming and keyboards as well as the instrumental and vocal arrangements. Shameem will be launching her new single “Beautiful Soul” in Perth with a full-band show at The Ellington Jazz Club on Friday 27 June. The show will include a premiere screening of the music video for the single, produced by Perth digital media start-up Red Bird Creative. “Beautiful Soul” is the first single from The Second City, Shameem’s forthcoming sophomore album. The single will be available on YouTube and for online purchase and streaming on June 28. To be the first with the links, subscribe to Shameem’s monthly e-newsletter here.